The term “human rights” was mentioned seven times in the UN’s founding Charter, making the promotion and protection of human rights a key purpose and guiding principle of the Organization. In 1948, the Universal Declaration of Human Rights brought human rights into the realm of international law. 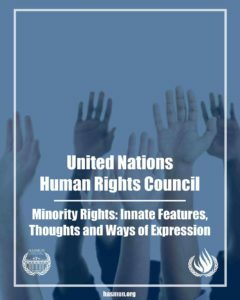 The Human Rights Council is an inter-governmental body responsible for strengthening the promotion and protection of human rights. According to UN’s official information; gender equality and human rights are some of the global issues. This year in HASMUN we will be focusing on, minority rights. We are going to discuss about innate feature and our choices. These both can make everyone a minority. Someone can be an Asian in Africa or a black person in a country which has 99% white people, also someone else can be a non-believer in a religious country. In this world, people have so many different thoughts and each person has his or her own ways of expression. And I looking forward for discussing those all with considering different countries’ different perspectives in HASMUN’19 with the efforts of you, esteemed participants.